Patterns are easy to mix is you think of it as rhyming. Today's post is part of Everybody Everywear- a group event where bloggers join together and post outfits based on an agreed theme. This month the theme is: PATTERN MIXING. For some reason, wearing mixed prints is easy for me, I love mixing up a good cocktail of patterns. I sort of think of pattern mixing as writing poetry with clothing- you seek out rhythm and pattern and meter in poetry, the same elements that make up a good outfit. One of my favorite pattern mixes are polka dots and leopard print. As I've stated before, I think that polka dots are the animal print of the urban jungle. It's hot here in Sac-town, so layering isn't really an option, so you're seeing patterns stripped down to their essence: Checks (head scarf), Florals (sun glasses), Polka Dots (Romper), and Leopard (Shoes). The secret to a good pattern mixing is to find a unifying element- in this case the color black and similar size of pattern. What are your favorite patterns to wear together? Leopard is the polka dot of the animal kingdom. It totally works!!! You took prints that, if of different size scales, would not work at all, but because of the size, it is a perfect harmony!! Love it!! Plus, you look great in the romper, and that vintage purse is GORGEOUS!! 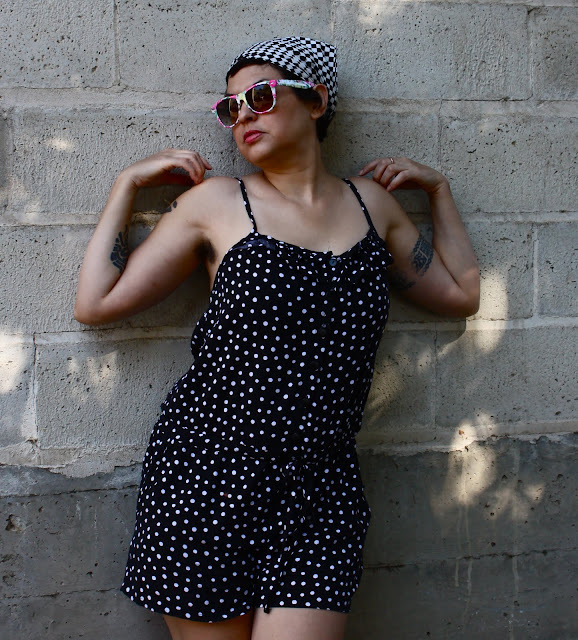 this is (sorta) NOT a shameless plug, but yesterday i posted some summer frocks that are going to be 'on sale' for this weekend's HOUSE of FRINGE BINGE! (...where YOU the Mighty Pentameter) will be hangin', c'est vrai?). anyway, in my 'album' of 'VINTAGE' i included a 'set' that's a mix of patterns, in this case it was a "Lady Arrow, cotton, collared button-down with a pair of "HOME EC 2A" darted, high-waisted, thigh-length shorts. ...like i'm channeling you, bella...and visions of sugarplums and cherries on the vine are dancing in your head. Props to all you pattern mixing gals. I love this mix! I've tried and tried to figure it all out and it was just an epic fail!!!! I've now given up, I'm not a pattern mixer. I am really enjoying looking at everyones posts though. Bella, you're always so eloquent - I love reading your posts! The leopard shoes are a great touch. Today's event should be called EveryBody Everywear: Bella's Page!! for you are the queen of pattern mixing! Love the way you tossed in the shoes!! Looking so cute and hot,chicka! Nicely done! It was scorching here in CO as well today! I love the pattern of the scarf and romper. By the way, I LOVE rompers! Loving the romper, the leopard prints sandals and that great white wicker purse. You are the master. I will remember your poetry analogy! I love it! "polka dots are the leopard print of the urban jungle!" I struggle with pattern mixing... only because i am super neurotic and am too matchy-matchy (i get it from my mom! ), although believe it or not I am working on it... i have been for the last year or so... it's hard when i don't really have too many patterned pieces... maybe i need to step outside my comfort zone and get more patterned things. you make it look so fun to mix it up! Great idea! (the headscarf print). Very cute romper. I got one, but I'm not sure that I'm brave enough to wear it. I've never thought of clothing being like wearing poetry, but that really does sum it up well. Your posts are always so beautiful, much like you. You are a print mixing ninja! You seriously make it look so easy! 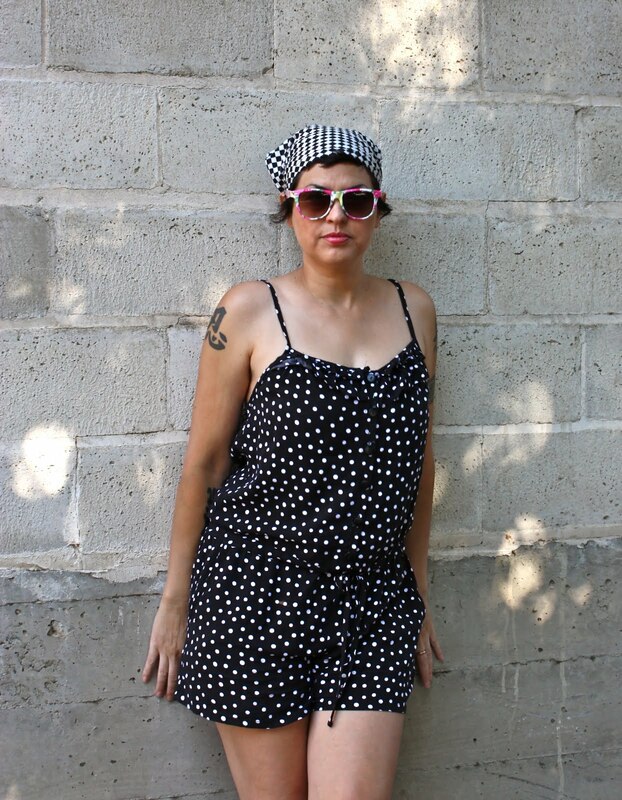 lovely romper and lovely pattern mixing, polka dot & little checks with leopard shoes is such a perfect combo! And I love to mix polka dots with strips, black&white is always appealing for me! Poetry in patterns ... excellent mixing! I love this whole outfit, metered in iambic pentameter! 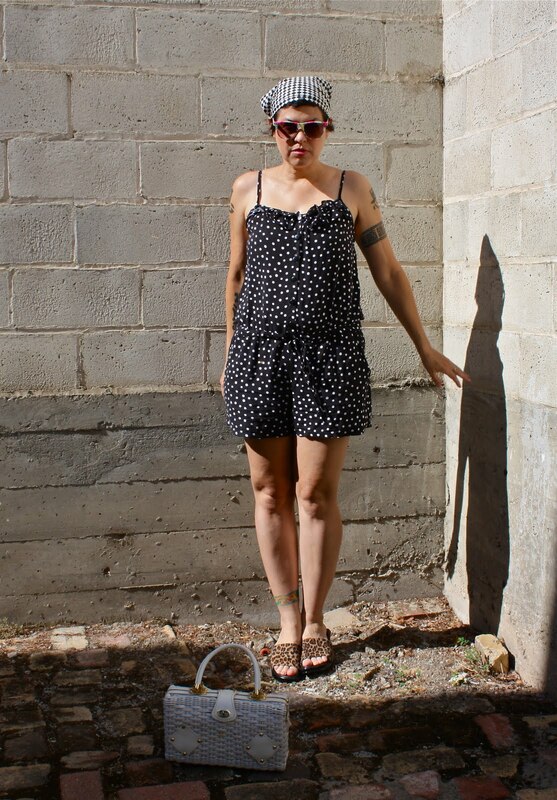 That black and white romper looks great with all the little touches of other patterns! Love, love, love! You look amazing (and hopefully a bit cooler than all of the bloggers who layered their patterns!). You know how I feel about polka dots! You look so cute, this is an outfit right out of my closet! Yeah, you make lots of things look hot. I wish pattern mixing came as easy to me as it does to you but I tries!